Now that’s a bold and provocative set of marching orders. Which is what we have come to expect from Calacanis, the Brooklyn-bred journalist turned entrepreneur turned podcast impresario—and one of the top five angel investors in the world. “Angel,” Calacanis’ first book, went on sale Tuesday. It’s brash, candid and opinionated, much like the author, and it’s a refreshing change of pace from the dry and oh-so-serious angel investing tomes that have preceded it. More important, “Angel” is a fun, practical, accessible, rigorous and smart tutorial on how you, too, can become a gazillionaire—assuming you have the requisite stomach for startup flameouts, countless meetings and the likely downsizing of your bank account. As anyone who has spent serious time investing in startups knows, it’s often more art than science. If it were science, then algorithm-powered robots would make the best investors. But that’s not how it works. So Calacanis provides the formula, you provide the gut, and in five to 10 years we’ll see how you do. Your instructions begin with plunking down ten $1,000 investments as part of a follow-the-leader angel syndicate, followed by “making twenty $25,000 bets and quadrupling down on the winners with a $100,000 follow-on investment.” As a result, no investment in your portfolio is more than 1.25 to 2.5 percent of your net worth. Smart. “Angel” covers all the major bases. Calacanis outlines cap table basics, deal memos, due diligence, the pros and cons of joining startup boards, how angel syndicates work, how to identify businesses that scale, the right questions to pose to founders, the importance of traction, how to determine a reasonable valuation, the value of information rights (monthly updates from the founding team) and the No. 1 rule: Invest in the founders, not in the idea. Along the way, the author shares some hilarious spot-on anecdotes, as when he jabs “the precious little snowflakes from Y Combinator” who think they’re so special that the normal investment rules don’t apply to them. I give Jason credit for having the cojones to take these stabs at how the future will unfold. Here are four of Calacanis’ provocative prognostications in “Angel” and my reactions—go ahead, play along at home! This is half the fun of reading “Angel.” You’re making bets on how to read cultural signposts and social megatrends. Angel investors will either go with the flow while sitting around the bargaining table (he calls it Groupthink, I call it Sheepthink) or you’ll go your own idiosyncratic way. And in the end, whether you agree with how Calacanis reads the tea leaves or not, the bottom line is that he has an impressive track record as an investor. He has built a portfolio worth more than $150 million, much of it because he hit an inside straight with an early investment in Uber: He invested $25,000 in Uber when it was valued at $5 million, and it’s now worth somewhere between $50 billion and $70 billion. 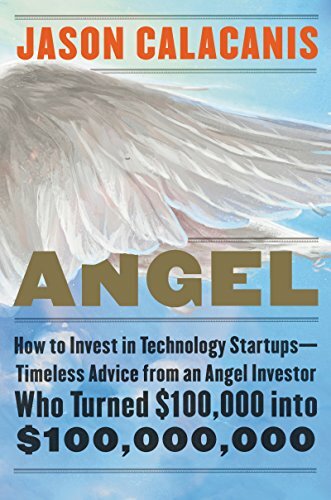 I always include some feedback for the author in my book reviews, so here are two nitpicks: I would have liked to have seen “Angel” explain the shortcomings of some of the newfangled investment vehicles like equity crowdfunding that a lot of first-timers might naturally gravitate toward. And an old-fashioned index for the book wouldn’t hurt, either. You get back less than you invested. You get two to five times what you invested. You score returns of 5x or more—perhaps even “200 or 300 or 400 times your money” because you placed your bet on a future “unicorn.” Congrats, you’ve hit the lottery, many times over! Are there waves and waves of wannabe angels waiting in the wings? Personally, I’m skeptical that there are waves and waves of wannabe angels waiting in the wings, as it were. Yes, there are lots of one-percenters out there, and yes, there are lots of rich folks who would love to get in the game. But how many of them will actually go through the rigors of a proverbial Camp Lejeune, the Marine Corps base camp that separates the wusses from the warriors? How many will have the patience for taking thousands of meetings? Perhaps I’m hanging out with the wrong group of rich people, but most millionaires I know are incredibly risk averse and already have the wherewithal to send their kids to the best colleges, leave them a trust fund and buy a big ol’ boat. I hope I’m wrong about that. I hope there are thousands of people who buy “Angel,” take its lessons to heart and help launch the next wave of disruptive tech innovation. Calacanis has provided a detailed roadmap. Now who will be brave and foolhardy enough to take up the quest? J.D. Lasica, an entrepreneur, author and former book editor at the Sacramento Bee (among many other things), releases his book reviews under a Creative Commons license; his reviews may be republished with attribution.